Revs. Daijaku Kinst and Shinshu Roberts are Zen priests and teachers in the lineage of Shunryu Suzuki Roshi. Both Shinshu and Daijaku trained at the San Francisco Zen Center and Tassajara Zen Mountain Center. Both Daijaku and Shinshu are members of the Soto Zen Buddhist Association, the American Zen Teachers Association and are registered as teachers with the Japanese Soto School in Japan. Daijaku, ordained in 1988, received formal authorization as independent Zen teacher in 2005 from Sojun Weitsman, Roshi Abbot of the Berkeley Zen Center. She has taught and led retreats in a variety of settings including Gampo Abbey with the Venerable Pema Chodron. 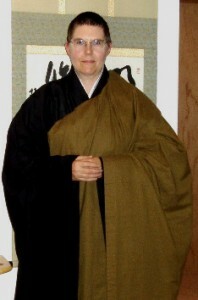 She received a Ph.D. in Buddhism and Psychology from the California Institute of Integral Studies and is currently a core facility member and director of Buddhist Chaplaincy Program at the Institute of Buddhist Studies, an affiliated graduate school of the Graduate Theological Union, Berkeley, CA. Shinshu was ordained in 1988 and received teacher certification in 2005 from Sojun Weitsman, Roshi, Abbot of the Berkeley Zen Center. She trained for 17 years at the San Francisco Zen Center holding various leadership positions during that time. 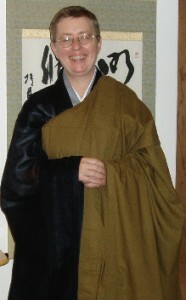 She holds the appointment of Kokusaifukyoshi (International Teacher) with the Soto Zen School in Japan. Commentary on Ziyong’s Ship of Compassion. In Record of the Hidden Lamp: 100 Koans and Stories from 25 Centuries of Awakened Women. Wisdom, Fall 2013. Cultivating an Appropriate Response: Educational Foundations for Buddhist Chaplains and Pastoral Care Providers. In The Arts of Contemplative Care: Pioneering Voices in Buddhist Chaplaincy and Pastoral Work. Wisdom Oct 2012. Papers: Thomas Merton, Self, Surrender, and Contemplative Psychology: A Buddhist Perspective Society of Buddhist Christian Studies, American Academy of Religion. 2009. Self and Transformation in Soto Zen Buddhist Practice 2008 International Symposium: Beyond Ego Psychology: Journeys of the Heart East and West Ryokuku University. Kyoto, Japan. “Moshan’s Mountain Summit”, Record of the Hidden Lamp: 100 Koans and Stories from 25 Centuries of Awakened Women, ed. Susan Moon. Wisdom Publications, 2013. “Astride the Highest Mountain: Dogen’s Being/Time”, Receiving the Marrow: Teachings on Dogen by Soto Zen Women Priests, ed. Eido Frances Carney.Temple Ground Press 2012.